It’s December 23rd, and today’s Book Monsters advent post is a book I’m not even sure where to begin with, it’s so wonderful. 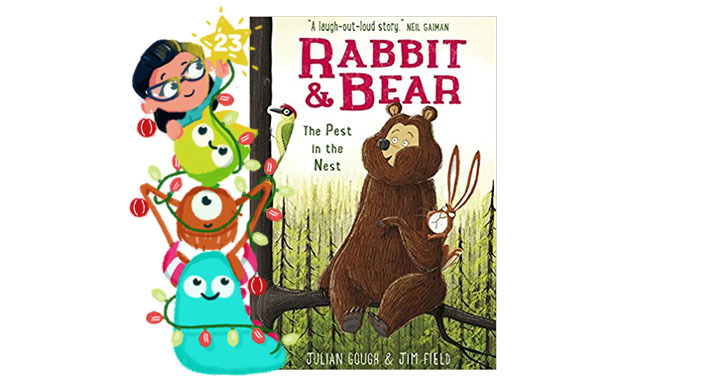 It is Rabbit & Bear – The Pest in the Nest written by Julian Gough, illustrated by Jim Field and published by Hachett Children’s Books. I read and loved the first Rabbit and Bear book. I loved it for it’s combination of storytelling, humour, non-fiction elements and Jim’s gorgeous characterful and atmospheric illustrations. The Pest in the Nest follows the rather angry and anxious Rabbit, as he gets more and more wound up by a new visitor to his quiet forest neighbourhood. The visitor is a happy Woodpecker, who spends all day pecking away at the tree to get grubs and make his nest, all the while making a terrible noise. Rabbit’s friend, the lovely sweet Bear, tries to calm Rabbit down and help him focus on other things. This book has all the humour and all the gorgeous illustrations as before, but there’s something a little more special about it. In this fast, frantic world, we’re all rushing about, quick to get angry and wound up by the small problems. Pest in the Nest is a book that uses humour and characters to give children a first introduction into a more mindful and calm approach to life. It’s absolutely brilliantly done. 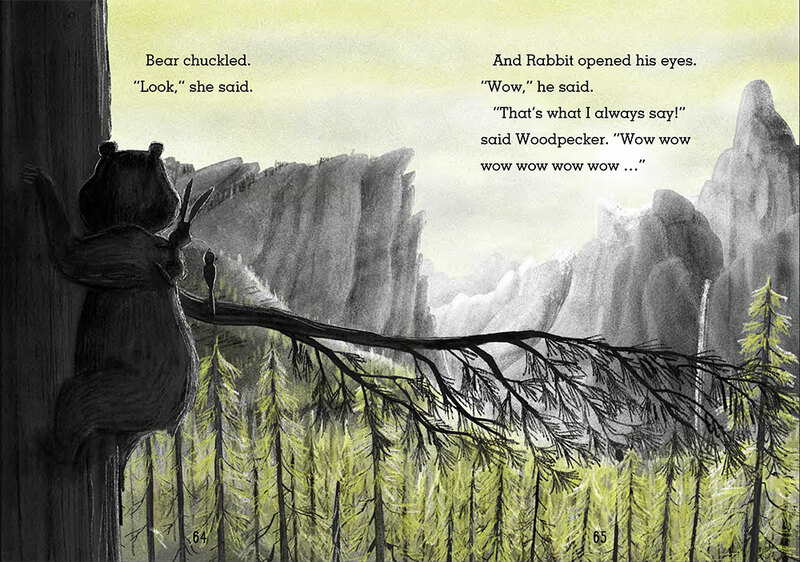 Through the story there are little insights into how our minds work, and suggestions on how we can work to help them, are given via Bear and Rabbit’s interactions. For example, at one point in the story Bear explains how Rabbit’s thoughts are making him unhappy because he focuses on the wrong things. Rabbit claims that the world is what makes him unhappy and he “… must change the world!” Bear helps Rabbit realise that he just needs to change how he thinks, focus on the positive rather than trying to change everything and everyone else and, as a result, he will feel better. For children (and adults actually) struggling to cope with anger, or anxiety, this is an absolutely crucial lesson to learn. It’s exampled so brilliantly in this short book, I truly felt quite touched and enlightened myself when I read it. Jim’s illustrations, as always, bring humour and bags of atmosphere to the story, echoing and supporting Julian’s wonderful guidance. Jim’s technique with a limited colour palette is so unique to these stories, simple, yet full of depth and emotion. Some of the nature scenes in this book are breathtaking. 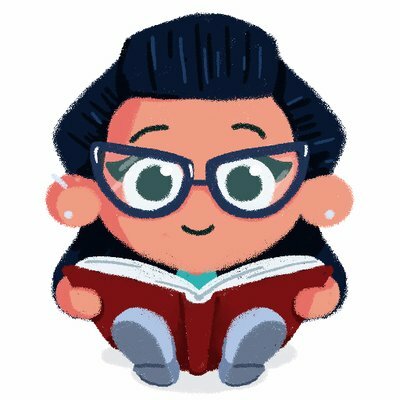 The Pest in the Nest visually looks like pure entertainment, it reads like pure entertainment and yet they have real importance and value, and that’s why I’m in book love.